Children's Stories - If I Can Help, I Will! If I Can Help, I Will! Christopher had a wonderful gift, compassion. Whenever he saw something or someone hurt, he’d be the first one there to comfort them. One day, as he was out playing with his trucks in the sandbox, he heard a noise coming from the pine tree in his back garden. He stood up to see what it was. Two birds were fighting with each other. One was much bigger than the other. Christopher watched as the bigger bird flew away with a grasshopper in its beak, after stealing it from the smaller bird. Just then a bluebird fell from the branch. "Oh no!" Christopher gasped. He ran over to the bird. "It’s got a broken wing," he frowned. He picked it up ever so gently and carried it into the house. "What have you got there?" his father asked, walking over to see. "A bluebird? Why are you bringing it into the house?" "A starling attacked it and stole its food. It must have snapped its wing. I’m going to fix it. If I can help, I will!" Christopher announced. He’d fixed other bird’s wings before and knew what to do. "That’s very kind of you, Christopher. Be careful though. Don’t get too attached. You know once it’s healed that the bird will need to free again," his father said. "I know, Dad. I just want it to get better," he replied. He took the bird into his bedroom and fixed its wing with wire and bandages. Every day he went out to find worms, ladybugs, flies, moths and other insects. It took a long time but finally the bluebird’s wing healed. "Time to let you go now," Christopher said. He took the bandages off the bird and carried it outside. He opened his palm and the bluebird flew into the tree. "Take care of yourself," he shouted and waved goodbye. Another time he was walking to school and heard some tiny meows coming from a bush. He bent down. There were two kittens, tiny things, curled up in a ball, shivering from the cold and dampness and by the looks of them, half starved. Instead of continuing to school, he put the kittens in his pockets and headed home. "What are you doing home? Why aren’t you at school?" his mum asked. He pulled the kittens out of his pockets. "They were going to die, Mum. I couldn’t let that happen. Just let me warm them up and feed them and then I’ll go to school," Christopher said. His mum knew there was no use fighting with him. She knew his love for animals. "When they’re old enough, we’ll have to find homes for them." "I know, Mum." He took the kittens into his room and dried them with a towel. He sat by the heater so they would be warm. He left them for a few minutes and went into the kitchen. He poured some milk into a bowl and added some torn up slices of bread. He carefully carried it back into the bedroom and put it down in front of the kittens. 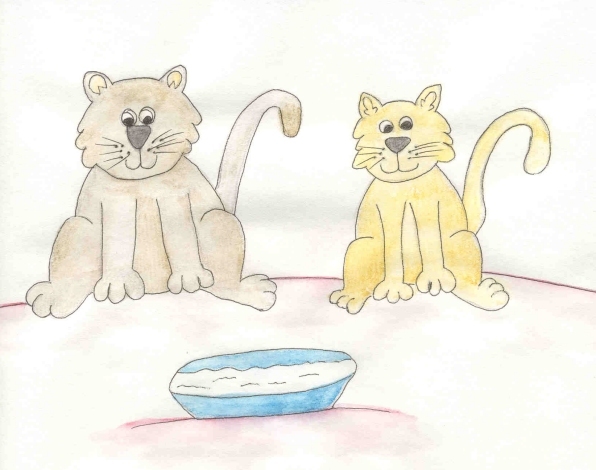 They began to meow and lap up the milk. "You two stay here and keep warm, drink your milk, and I’ll be back later," Christopher said. He shut the door and headed for school. When he got home, the kittens were sleeping soundly. He was worried that they weren’t alive but when he came closer, he saw they were breathing. The milk was gone from the bowl, so he refilled it and put it down. The kittens woke up and seemed to be feeling much better. "I think I’ll call you Wynken and Blynken," he laughed, petting them both. In a few days the kittens were running about, chasing bits of yarn and trying to climb up his bed sheets. After a few weeks, Christopher put a sign up advertising free kittens. An elderly lady came by and took both of them home. Christopher was sad to have them leave, but knew she would take good care of them. Christopher’s mum stood at the living room window. She saw him carrying a box. "What’s he got this time?" she laughed.